Place the short ribs in your slow cooker. In a measuring cup whisk together the garlic, ginger, soy sauce, vinegar, sesame oil, sriracha, and honey. Pour over the ribs. Cover and set the slow cooker to low and cook for 7-8 hours until the meat is falling off the bone and has caramelized around the edges. Do this overnight or in the morning before work. Transfer the meat to a bowl and shred with a fork, discarding the fat. Skim the fat from the remaining sauce in the slow cooker. Add up to ½ cup of sauce to the meat and gently toss. Using a mandonline, very thinly slice the kohlrabi into rounds to use as your taco shells. Chop the garlic scapes thinly. 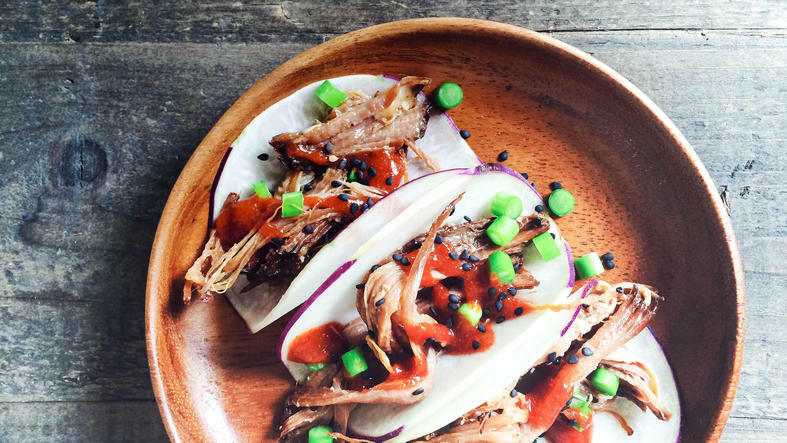 You can let everyone assemble their own tacos at the table, but these are especially impressive plated. 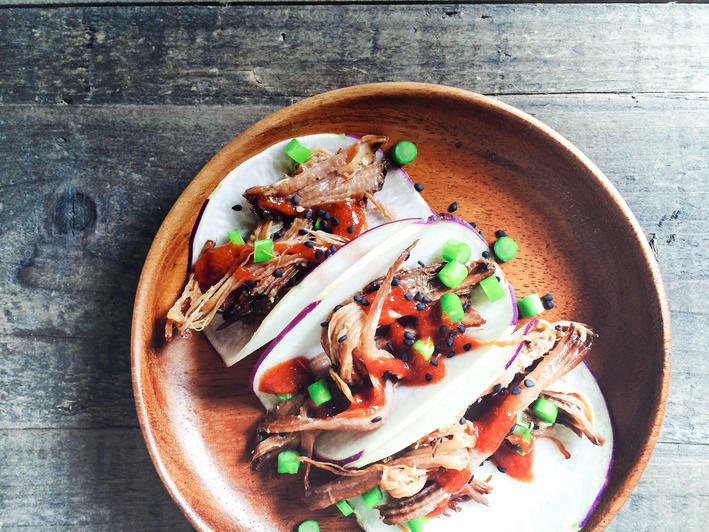 Place 5-6 kohlrabi “taco shells” on each plate, filling it with braised beef and sprinkling with garlic scapes, sesame seeds, and a drizzle of sriracha if you’d like, or another favorite Asian condiment. Serve with rice if you’d like a heartier meal. If you have cilantro on hand it’s great here too. New favorite way to eat kohlrabi, right? Ours too.